Squeeze, shape, mold and extrude all kinds of crazy shapes with this classic set! 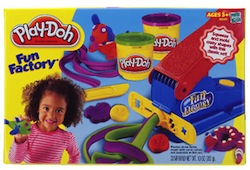 2 shapemaking strips have 10 patterns for extruding long strips of PLAY-DOH compound! Includes two 5-oz. cans of modeling compound, extruder with 3 half molds, 2 shapemaking strips (10 designs) and trimmer knife.